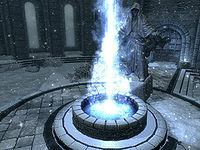 Purify the focus points for magical energy around the College of Winterhold. The focal point in the center courtyard of the College of Winterhold. Travel to each of the focal points around the College of Winterhold. Activate them with the Mystic Tuning Gloves equipped. Drevis Neloren can be found in the Hall of Countenance at the College of Winterhold. Ask him if there is any College business that you can assist with and he will answer, "There may be a matter in which your... skills... could be useful. The various points of focus for magic energies around the College have become polluted, and need cleansing. The magical energies underneath the college still require purification. Your assistance would be most useful." When you agree to help, Drevis will provide you with the mystic tuning gloves and let you know what needs to be done: "…These specially enchanted gloves will allow you to delve directly into the focal points for these energies. Go to each focal point and remove whatever impurities you may find there. Return the gloves to me when you have finished. Please exercise caution. This is not a procedure without possible... consequences." The three magical focal points associated with this quest are the large, blue, fountains of energy found around the College. One is outside in the main College courtyard, one in the Hall of Countenance and another in the Hall of Attainment. In order to begin equip the mystic tuning gloves to receive the Activate Mystic Focal Point prompt when you approach each font. Despite Drevis' warning, the purification process is quite simple with no real consequence associated. Once all three focal points have been purified, return to Drevis. When you tell him that the focal points have been cleansed, he will respond "Yes, they have. I can feel the difference already. But of course, I'm far more in tune with these sorts of things than most. Thank you. I appreciate your assistance." Your reward for completion of each location is random soul gems and/or temporary Regenerate Magicka effects (see bugs section). Based on the game data, it appears that five points were originally intended, but only three were implemented in the final game. One of the additional points would have been a pillar at the base of the first ramp coming down from the college; the other one has no location assigned. In addition, one of the possible effects would have been to spawn a creature, however this is also unimplemented. You can usually cleanse a focal point twice by clicking the activate key/button repeatedly, for two rewards at each location. You can pickpocket the Mystic Tuning Gloves off of Neloren immediately after finishing the quest. However, they will be marked as quest items if you do so, meaning that it will be impossible to remove them from your inventory afterwards. When cleansing the foci, either or both of two different bugged two-hour boosts to magicka regeneration may be placed on you. In your Active Effects list, they appear as "Fortify Magicka"; one with a nominal drain effect, the other with a nominal fortify effect. These boosts appear to stack. Some players have reported that they remain much longer than two hours. If you installed Dawnguard, you can use dispelallspells to dispel all active effects on you except enchanted equipment. The magicka regeneration may actually give you unlimited magicka for a time. It is possible to get Drevis to give you the quest more than once. A dragon attack on the College of Winterhold may disrupt this quest and not register the foci as cleansed. Simply kill the dragon and return to all focal points and reactivate as necessary. ? The gloves may not appear in your inventory, even with attempts to add them using console commands. ? 10 Drevis Neloren has asked for my help in purifying the focus points for magical energy around the College. I've been given special Tuning gloves that I'll need to wear in order to cleanse the focal points. Drevis has warned that there may be side-effects to performing this task. 20 I've finished cleansing the focal points around the College, and should take the gloves back to Drevis. 200 Finishes quest I've successfully helped Drevis by cleansing the focal points around the College. On the PC, it is possible to use the console to advance through the quest by entering setstage MGR02 stage, where stage is the number of the stage you wish to complete. It is not possible to un-complete (i.e. go back) quest stages, but it is possible to clear all stages of the quest using resetquest MGR02.